Root beer float flavor comes from wonderfully nourishing fermented herbs. It comes with a touch of smooth and creamy vanilla flavor to give you a yummy taste. This flavoring is mild, amazing and delicious in drinks, beverages and ice-cream. 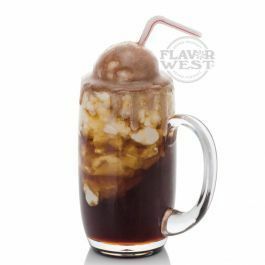 Type: Root Beer Float Water Soluble Flavoring. Ingredients: Natural and Artificial Flavoring, Propylene Glycol and Ethanol. USP Kosher Grade Flavoring. Usage Rate: 15-20% for E-use. Flavor Suitability: Suitable for desserts, ice creams, pastries, candy, lip balm and more. Specific Gravity: 1.02 No Refunds on Flavoring. I gave these five stars because so-far-so-good. Great Root Beer float flavor! Perfect as a stand alone. Nice job FW!